French investigators are examining whether a lorry driver has become the first victim of a toxic seaweed that is clogging parts of the Brittany coast. The driver died in July after carrying three truckloads of sea lettuce away from the beaches where it has been decaying, releasing poisonous gas. His death was originally recorded as a heart attack but prosecutors want to know if it was linked to the seaweed. France's PM warned of the health risk while visiting the beaches last month. Francois Fillon announced that the government would pay for cleaning up the beaches polluted by the sea lettuce, Ulva lactuca. Locals had raised the alarm after a horse, being ridden over the sands, collapsed and died. Its rider fell unconscious and had to be dragged off the algae-coated beach. By then, the lorry driver had already died. The 48-year-old driver had been working without a mask or gloves and died at the wheel of his vehicle when it crashed into a wall, reports Tim Finan in Brittany for the BBC. The man had been part of the annual operation to remove 2,000 tonnes of rotting sea lettuce from the beaches at Binic. His family have so far refused to allow an autopsy to establish the exact cause of his death, but on Monday the local prosecutor ordered a preliminary investigation. Christian Urvoy, the mayor of Binic, said: "'We want to know if in future we should take precautions to safeguard workers who collect or transport seaweed." A spokesman for the local authorities has strongly denied they were aware of the death when Mr Fillon visited St-Michel-en-Greve in August. Researchers from France's National Institute for Environmental Technology and Hazards (Ineris) have visited the same beach and found hydrogen sulphide in such concentration that it could be "deadly in few minutes". 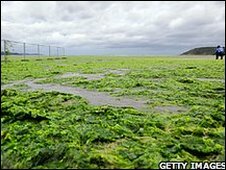 Sea lettuce is harmless in the sea, but as it decomposes on the beach it releases the deadly gas. Environmentalists say decades of misuse of Brittany's agricultural land is to blame for the explosion of algae, due to the high levels of nitrates used in fertilisers and excreted by the region's high concentration of livestock. They have called for tighter controls on farming.